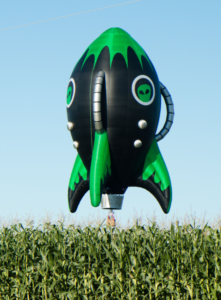 Balloons over Waikato Trust are excited to announce our third Special Shape landing at Balloons over Waikato 22nd – 26th March… The Alien Rocket! The Alien Rockets is as tall as a 10 storey building, standing at a height of 29 metres, and extraordinarily was designed and built completely by the pilot, Canadian Alain Bard. Bard is very excited to visit New Zealand, “I’ve travelled to over 40 countries so far,” he says, “I am really looking forward to flying the Alien Rocket over the Waikato and inspiring a new generation of kids to find out more about space, astronomy and learn about our fragile existence on this planet”.